Last week I had a great time chatting about digital marketing with some of our region’s marketing leaders. 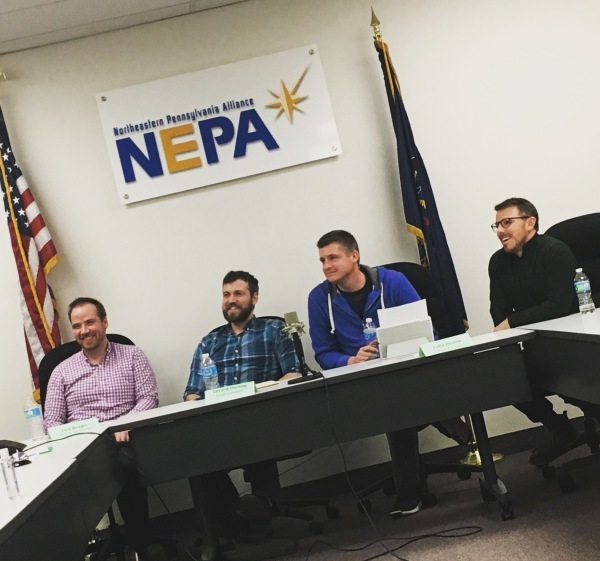 Hosted by the University of Scranton Small Business Development Center, I was joined by Colin Devroe from Condron & Cosgrove, Gerard Durling who leads Coal Creative, and Ben Giordano founder of Freshy Sites for this hour and a half long discussion. While we all share some similarities in terms of our background and types of organizations we’ve been a part of, what was most interesting to me was how we all use our knowledge not only to aid our clients, but at one point or another, to also help our own entrepreneurial endeavors. This is especially of note when it comes to the topic of digital marketing. While we look for solutions uniquely positioned for each of our clients, we all work daily to market our own businesses online too. In short we aren’t only working with the tools and techniques for our clients we are also leveraging them for our own organization’s goals. Much was covered in the discussion centered around effective website design principals, content, Search Engine Optimization, email marketing, and analytics. There was so much to cover we could have talked for hours! Over the next few weeks, I’ll be delving into each of the above a little more. I believe there’s always an opportunity to share some of the fundamentals of effective marketing with you and to help better explain how digital components fit within a modern organization’s overall marketing strategy.